Looking for a fun team building activity? Come to the park and help construct the equipment for the new all-access playground, due to open by October 1! 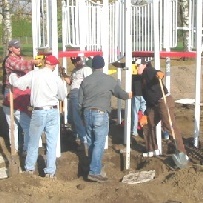 About 15 volunteers per day are needed for half-day or all-day shifts for Community Build Days, Aug. 24, 25, 26. Especially needed are volunteers comfortable working with power tools. Volunteers must be at least 18 years old. Lunch will be provided!